iPresort / Total Fulfillment has been providing quality mailing and fulfillment services at affordable prices from the Dallas-Fort Worth Metroplex since 1993. We specialize in small to mid-sized mailings from 500 to 500,000 pieces. 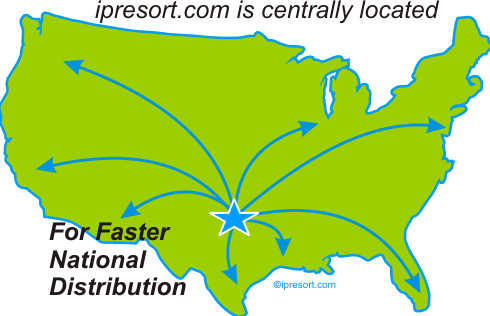 We are centrally located for faster national distribution of your presorted mail and marketing materials. Our clients include non-profit organizations, educational facilities, hospitality industries, hotels, restaurants, national software companies, printers, advertising agencies, and even the United States Coast Guard. We are located at 2330 Jett St., Dallas Texas 75234. We can be reached Monday through Friday between 9 a.m. and 4 p.m. at 972-620-0368. We'll answer questions, make suggestions, provide cost estimates and do whatever is necessary to get you the information you need to make your direct mail campaign a success. We’re happy to spend time with our customers in the planning stages to make sure their mail piece is designed to run on the post office’s automated equipment. iPresort / Total Fulfillment works hard to ensure that every mailing is processed correctly, on time, and saves you postage.